One of our co-founders visited the site of the new borehole in 2017. We will update you on our progress once the construction is completed. Mulumini Secondary School is located in a semi-arid area in Ukambani, Eastern Kenya. People living in this region rely on harvesting rain as a source of water for food and sanitation. Since not everyone has the ability to harvest rainwater, using crude tools, some villagers resort to digging up shallow wells in riverbeds. This water sustains them for a short period before drying out. The only choice they have is to walk for miles on end, sometimes as far as 5 miles in search of water, which they then carry back to the village on their heads or backs! Together with their parents, school children are in the center of providing this labor. This cycle repeats itself everyday until the rainy season returns. The scarcity of water leads to poor sanitation and malnutrition. For several years, this has also led to a steady decline in student enrollment and a high prevalence of preventable diseases. School children are faced with the challenge of looking for water. They either have to look for this precious 'clear gold' in the morning before school or in the evening after school. Workers from Maji Africa lowering water pipes into the well after they completed the drilling process. 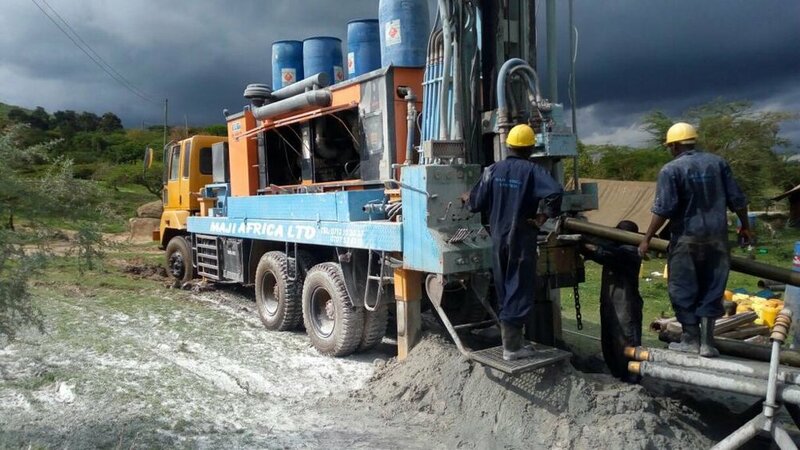 Rehema Education Fund recently drilled a borehole that provides water directly to Mulumini Secondary School and the surrounding village in order to alleviate this sad situation. Providing water to this school and the local village has helped reverse some of the challenges that water scarcity had created. Children are now able to focus on their schoolwork. They are now also able to enjoy being children again! Malnutrition is slowly being reversed as villagers can now grow vegetables using water from the borehole. We are glad to be part of a revolution that is creating a healthier and happier society. Even though the water scarcity remains a huge challenge in the region as a whole, we are confident that together, as we sink one bore at a time, lives will be lifted and our children will have a brighter and promising future.